Devon also was a member of the World Team 400-way world record in 2006 and 357-way world record in 2004 as well as the Square One 200-way in 2010 and the Texas State Records in 2011, 2009, 2007, 2005, 2003 and 2002 and was on the 120 and 121-way sequential world records. Additionally, Devon is an avid scuba diver and underwater videographer. Katrina also was a member of the Square One 200-way in 2010 as well as the Texas State Records in 2009, 2007, 2005, 2003 and 2002. 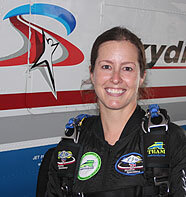 Additionally, Katrina is an avid runner, completing the Houston half-marathon in 2010, and also scuba dives. 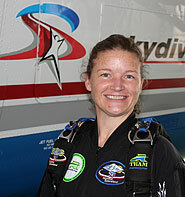 Additionally, she blogged for the 2009 USPA Nationals and is the architect of our team’s online Formation Notes system. Dave joined Spaceland Lite in late 2014. 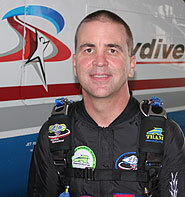 He started skydiving in 1997 and has attended Nationals every year since 2002. 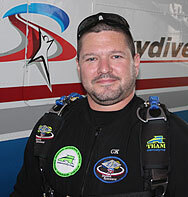 He has about 3900 jumps, 130 hours of tunnel time, and is an AFF Instructor. Texas State Record Videographer in: 2009, 2007 and 2006. Additionally, Cory is an avid outdoorsman/sportsman – hiking, mountain biking, rock climbing, skiing, sailing, camping and fishing. Yet he is still a techno-geek: actively developing and/or fixing software, databases, hardware, networks and graphics.